Over the weekend, Jon, Ellie, and I were having a somewhat quiet afternoon (okay, it was not all that quiet because life with our five year old is not quiet, but it was a bit chill). I was scrolling through my Instagram feed and saw all these awesome people hanging out at Urban Craft Uprising and couldn't handle not going. So off we went with just a few hours to spare. And it was so awesome to be in a room filled with so many amazing makers and people who love handmade. Ellie was full of so much energy and joy finding all the booths with stuffies and chatting up anyone who wanted to talk. Oh this kid. How she makes my life so much brighter. I found some really fantastic handmade goods that I'll be sharing in a few posts this month (I want to take some photos first of a few). As we were driving home, I started thinking about creating a new blog series here about all the handmade (or designed by makers) goods I find when I have on my curating hat and am sharing things over on Pinterest. So here we are: The first "I Heart Makers" column! I'll be spotlighting some of my favorite makers, some of my favorite products that I use and wear and have in my home, along with a few fun things that catch my eye as I'm perusing the Internet. Today, I'm spotlighting "Unicorns, Mermaids, and Rainbows" because those three things are current favorites for Ellie and me. As she would say, "We LOVE LOVE LOVE unicorns and rainbows and mermaids too, don't we Mama?" Yes, honey. Yes. We. Do. You might have seen this photo of me sporting my sparkly unicorn horn over on Instagram. It just delights me. My dear friend Alli gave it to me and she found it in Brooklyn Owl's Etsy shop. It's the perfect thing to put on when you're about to drive away from the ocean-front home where you've hosted a retreat and are feeling the sads come on. This rainbow cloud mobile is so adorable and from MilbotandChooky on Etsy. They have quite a few happy mobiles and garlands. Last month, we found this awesome unicorn towel for Eleanor at Pottery Barn Kids (she sometimes wears it for most of the day). AND THEN SOMEONE ON INSTAGRAM LET ME KNOW ABOUT AN ETSY SHOP THAT MAKES UNICORN TOWELS FOR ADULTS. Sorry. Couldn't stop myself from talking in a super loud excited voice just then. 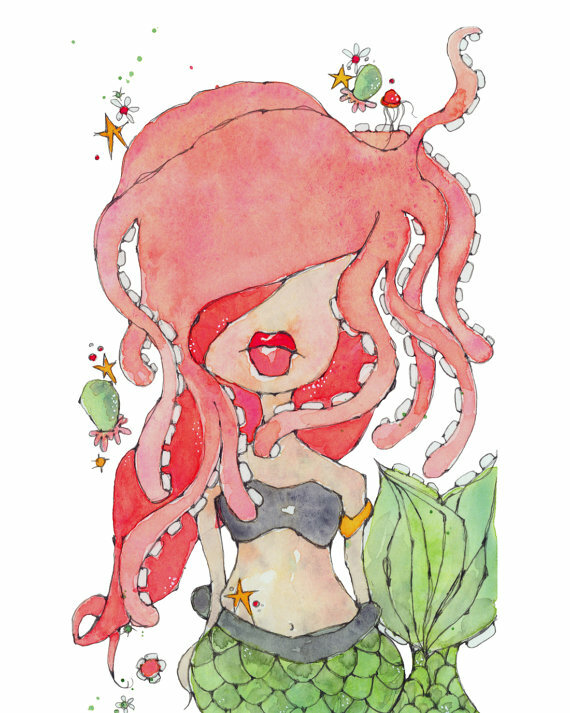 Check out these awesome towels from Yikes Twins (including mermaids!). I can't even handle it. Totally have one in my shopping cart right now. My new Reading Rainbow aka Brainbow phone case makes me so happy. It also comes as a pillow, totebag, and even a shower curtain. I can't help but smile when I see it and I'm totally thinking about getting this pillow. Have you seen Kelly's mermies yet? She's has some over on Society6 (like the one on the top of this post) and others in her Etsy shop. I heart these mermaids and their awesome ways. And I'm totally in love with Anna Wingfield's Magical Unicorn Anointing Oil. It has a very clean citrus and lavender scent. I'm using it in the moments when I want to invite in a bit more magic and playfulness with a huge dose of inner wisdom on the side. An invitation: Are you a maker? Share a link to your shop in the comments so I can visit your shop. Would love to possibly feature you in a future post.